Reagan Rouleau knocks down a pair of free throws for Delta Friday versus Patrick Henry. She had eight points for the Panthers. 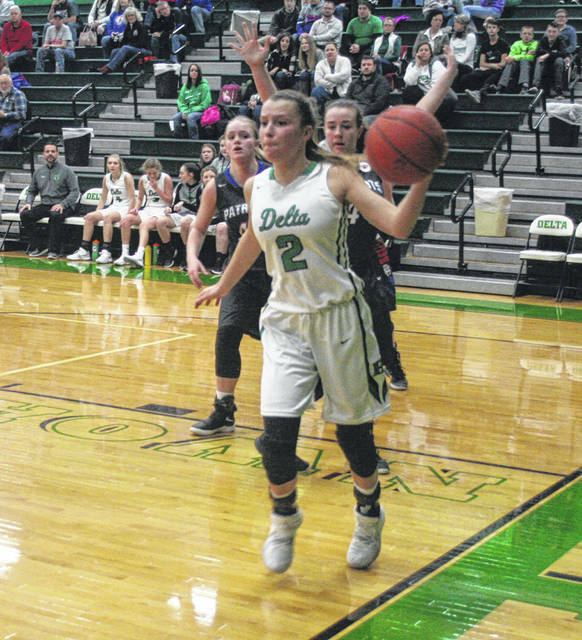 Brooklyn Wymer of Delta handles the basketball Friday night against Patrick Henry. The Panthers improved to 2-0 in the league with a 63-43 win. 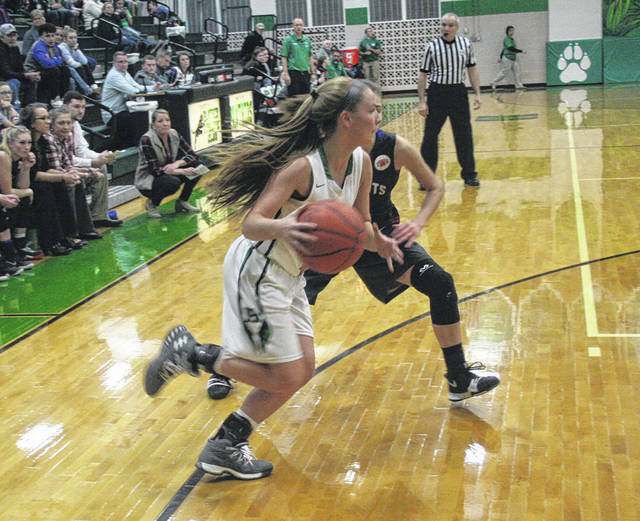 Brooklyn Green of Delta barrels into the lane Friday at home versus Patrick Henry. Abby Freeman of Delta kicks a ball out from along the baseline. She had a game high 32 points Friday night, then eclipsed 1,000 career points Saturday in a loss to Stryker. 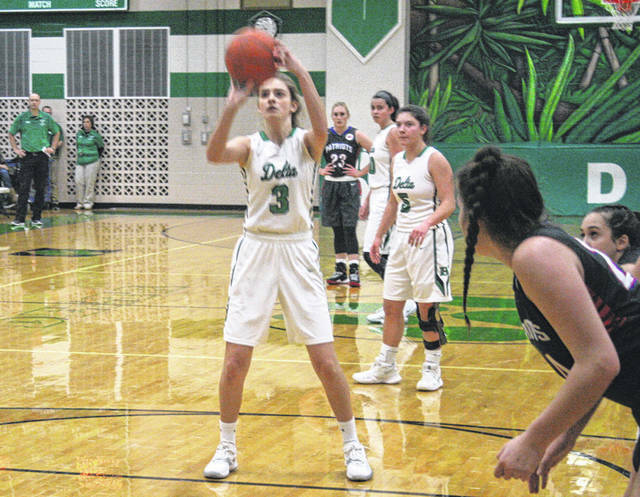 Delta girls basketball jumped out to a 12-point lead over the first nearly eight and a half minutes of the opening half in a Northwest Ohio Athletic League girls basketball contest at home against Patrick Henry Friday. But after the Patriots managed to tie it up in the second quarter, the Panthers regrouped after halftime in a 63-43 win. Delta led 15-6 after the opening frame thanks in large part to nine points from senior Abby Freeman. She would lead all scorers with 32 points. Reagan Rouleau notched four points off the bench in the opening quarter and finished with eight total. 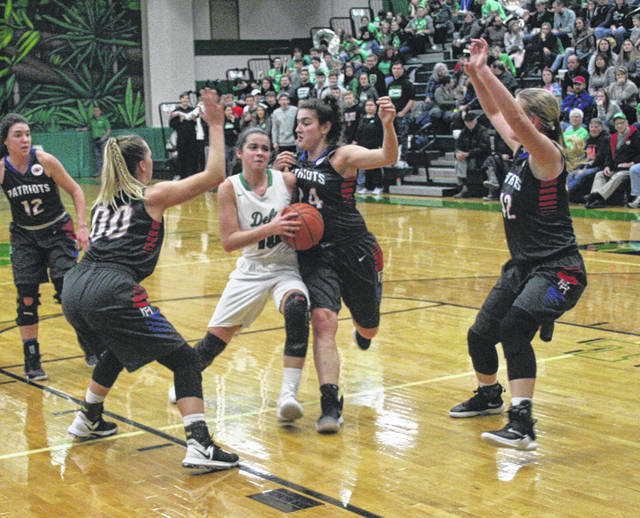 They then pushed the margin to 12 with a three-pointer from Braelyn Wymer 26 seconds into the second stanza. But, PH refused to go away. With the help of threes from Patrick Henry’s Audrey Sonnenberg and Natalie Nelson, the Patriots pulled within 22-16 at the 5:45 mark. MacKenzie Vance then converted a fastbreak opportunity for the Patriots, a Nelson hoop and Olivia Thompson’s drive and score knotted it at 22 with 3:10 until halftime. Freeman responded for the Panthers with consecutive hoops, then Vance split a pair from the line for PH. Delta’s Jessie Giguere hit 1 of 2 free throws while Freeman tacked on a pair, making the halftime margin 29-23. The Panthers outscored the Patriots by five in the third period, 14-9, to lead by double digits entering the fourth. They then got a huge final frame from Freeman. She tallied eight in the first four minutes, plus baskets by Brooklyn Wymer and Rouleau around a hoop from Sonnenberg to jump out to a 55-34 lead near the midway point. Sonnenberg finished with 10 points and Nelson had 10 for Patrick Henry. Delta did suffer their first loss of the season Saturday at Stryker, falling by a final of 35-31. However, on the bright side, Freeman surpassed 1,000 points for her career. Now 12-1 and 2-0 in the league, the Panthers host Liberty Center (3-9, 0-2 NWOAL) this Thursday and are at Lima Bath on Saturday. https://www.fcnews.org/wp-content/uploads/sites/45/2019/01/web1_Rouleau-hits-2-FTs.jpgReagan Rouleau knocks down a pair of free throws for Delta Friday versus Patrick Henry. She had eight points for the Panthers.